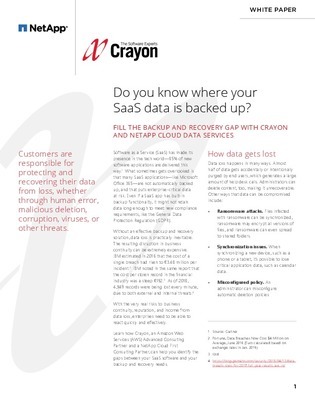 Do You Know Where your SaaS Data is Backed Up? Last year, almost 5,000 records were lost every minute, due to both external and internal threats. Even though a majority of apps are delivered via software as a service (SaaS), it’s easy to overlook the fact that many SaaS apps are not automatically backed up – putting critical enterprise data at risk. Don’t let unknown data loss threaten your business. Use this white paper to learn how to identify the gaps between your SaaS software and your backup and recovery needs.